LONDON, Nov 10 2014 (IPS) - Climate change is projected by many scientists to bring with it a range of calamities – from widespread floods, to prolonged heatwaves and slowly but relentlessly rising seas – taking the heaviest toll on those already most vulnerable. When a natural disaster strikes, people are sometimes left with no choice but to leave the areas affected. Yet, for some, even this option might not exist. While many could be uprooted in search of a safer place to live, either temporarily or permanently, some may become “climate hostages”, unable to escape. For the most vulnerable, climate change could mean double jeopardy – first, from worsening environmental conditions threatening their livelihood, and second, from the diminished financial, social and even physical assets required for moving away provoked by this situation. A project on migration and global environmental change led by Black was one of the first to draw attention to the notion of “trapped populations”. An example the Foresight report mentions is that of inhabitants of small island states living in flood-prone areas or near exposed coasts. People in these areas might not have the means to address these hazards and also lack the resources to migrate out of the islands. The report warned that such situations could escalate to risky displacement and humanitarian emergencies. In fact, past cases offer some evidence of groups of people who have become immobile as a result of either extreme weather events or even slow onset crises. One such example, says Black, is the drought in the 1980s in Africa’s Sahel region, when there was a decrease in the numbers of adult men who chose to migrate – the same people who would otherwise leave the area. Nevertheless, Black argues that in many cases it would be especially difficult to distinguish people who remain because they can and wish to, from those who are really unable to leave. In addition, environmental change could also drive people to migrate towards areas where they are even more at risk than those they have left. In the Mekong delta in southern Vietnam, researchers foresee climate change contributing to floods, loss of land and increased soil salinity. Facing these hazards, local residents in an already impoverished region could find themselves unable to cope, and also unable to move away. 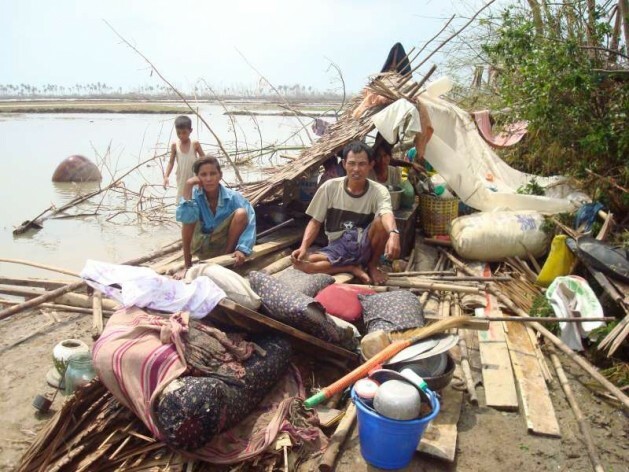 “It would generally be income and assets that will determine whether people can stay where they are or need to relocate,” says Dr Christopher Smith from the University of Sussex, who is currently conducting a European Community-funded project assessing the risk of trapped populations in the Mekong delta. Conclusions from the study are likely to be relevant to other cases around the world, and specifically to other low lying mega-deltas with similar characteristics, Smith adds. In Guatemala, researchers found that relatively isolated mountain communities could also be facing the risk of becoming stranded by climate change. According to a study published earlier this year, irregular rainfall could be posing a serious threat for the food security and sources of income of communities in the municipality of Cabricán who rely on subsistence rain-fed agriculture. Yet, the risks associated with climate change are not confined to developing countries. Hurricane Katrina, which hit the south-east of the United States in 2005, offered a vivid example when the New Orleans’ Superdome housed more than 20,000 people over several days. “That was to do with the fact that an evacuation plan had been designed with the idea that everybody would leave by car, but essentially there were sections of the population that didn’t have a car and were not going to leave by car, and also some people who didn’t believe the messages around evacuation,” says Black. Scientists are wary of linking Hurricane Katrina, or any single extreme weather event, to climate change. Yet, studies show that a warmer world might not necessarily mean more hurricanes, but such storms could be fiercer than those that these areas are used to. A paper on Populations ‘trapped’ at times of crisis written by Black with Michael Collyer of the University of Sussex and published in February, notes that while it might still be early to suggest specific policy measures to address this predicament, there are several steps decision makers can take, and not only on the national level. Intergovernmental fora – and among them the loss and damage stream in international climate negotiations – are yet to address specifically the challenge of trapped populations, but Europe might already be showing the way. A European Commission working paper on climate change, environmental degradation and migration that accompanies the European Union’s strategy on adaptation to climate change adopted in April 2013 mentions the risk of trapped populations, albeit implicitly only outside the region, and recommends steps to address the issue. Reviewing existing research on the links between climate change, environmental degradation and migration, the authors note that relocation, while questionably effective, “may nevertheless become a necessity in certain scenarios” such as the case of trapped communities. “The EU should therefore consider supporting countries severely exposed to environmental stressors to assess the path of degradation and design specific preventive internal, or where necessary, international relocation measures when adaptation strategies can no longer be implemented,” states the working paper. Ultimately, the situation where individuals, families, and indeed entire communities, find themselves unable to move out of harm’s way is not unique to the effects of climate change – it can be other natural hazards such as earthquakes and volcanic eruptions or human-induced crises like armed conflict. The international community’s response to people moving in the face of such crises is most often based on giving them a status, such as “internally displaced persons”, “asylum seekers” or “refugees”. But this would not be the appropriate response when people remain, argues Black. Stop drinking the kool-aid. And take a look at your subjects, maybe they should move their garbage twenty feet up the hill, the homeless sure do make a mess. New Orleans during Katrina had the buses to move most of the people but had a do nothing Mayor & Governor(both liberal democrats) who did nothing until too late and the buses were stranded!Let´s put the blame for that debacle where it belongs,state and city government!! Good report; Bangladeshis as well as many others know it. But, reactions are varying. People that think they may not be at risk are just talking about ‘funds’. But people that are thinking they may be at risk tend to be just become ‘resilient’ if they don’t have enough scopes to move to higher lands. environmental degradation for too long. And it is this failure in governance that has resulted in the most alarming environmental challenges that we face today. You know, markets can be excellent tools for certain purposes, but they do not have a social conscience, environmental ethic or long-term vision. So, it’s difficult to know what can successfully change this situation, but it would appear that a mass grassroots mobilisation maybe the answer, which would then provide some sort of counterweight to the skipping tendency of the global leaders. Thanks for the report, anyway.